Yesterday marked the one year anniversary of the release of Mass Effect 3. And with the release of the final piece of story DLC a few days ago, this seemed like an appropriate time to look back on a title that will likely be remembered more for it�s highly divisive ending controversy than anything else. And that is just a gosh-darn shame. But hey, we�re gamers. We can be a surly lot. It is a fact that if there were a Gaming Bill of Rights, the first amendment would be the right to go on the internet and complain about stuff. 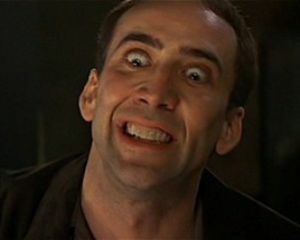 Hell, my last two blogs have basically just been lists of things in gaming that I don�t like. So, for this outing, I�ve decided to switch things up, and take a completely different mindset and approach, and acknowledge something that Bioware did smashingly, triumphantly, RIGHT. Like many instinctively skeptical gamers out there, when I first heard that Mass Effect 3 would feature a multiplayer mode, I scoffed. How could a franchise with such an emphasis on creating a personalized, intimate, single player role-playing experience possibly succeed at creating a compelling multiplayer mode? Why did they even need to? How could it be anything other than a tacked-on, derivative mess? After all, I thought the exact same thing when I heard that Bioshock 2 was adding multiplayer (and I was right). But Mass Effect 3 surprised the hell out of me. Even weeks after I had finished the campaign, I found myself going back to the horde mode style multiplayer to earn more credits, to unlock more characters and weapons, and promote and rebuild the characters that I had made (my favorite was my Drell Adept, whom I named �Reavin Steven�). However, just as the seasons change, so too do my gaming proclivities, and eventually I moved on to other things. Just recently, as the game�s anniversary brought it back to my attention, a friend and I found ourselves loading the game back up during one of our sessions of� X-Beer Live� (if you�re wondering what that is, basically we sit at our respective houses and drink beer while playing video games together on Xbox Live). Upon re-entering the multiplayer arena, I was absolutely shocked and elated at the sheer amount of content that Bioware has released in the last year. In 4 DLC expansions, the playable character roster has been more than doubled, and includes an incredible variety of characters. Ever wanted to play as a Volus? Well, you can now if you want to (sounds awesome and hilarious to me). There are also several new maps, new enemies, new objectives, and a new platinum difficulty level. Clearly, much of this content was developed and released in direct response to fan feedback and requests. The real kicker�..all of it is COMPLETELY FREE. It doesn�t cost you a dime (that's 8 Microsoft Points). Consider that in comparison, Halo 4 wants $10 from you for 3 measly new maps. 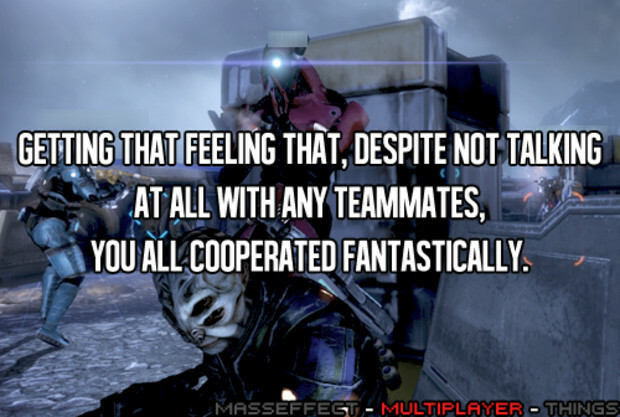 The multiplayer mode for Mass Effect 3 could�ve been just fine as it was at release. Bioware could�ve just called it a day and moved on to other things. Most gamers wouldn�t have been surprised or complained, since for most it probably wasn�t a big reason why they bought the game in the first place. Going back to the game now, almost a year later, and seeing how much support they have given to this mode both in terms of their weekend specials, and DLC expansions, I cannot help but be extremely impressed. So on behalf of myself and the rest of Mass Effect 3�s still fairly populous multiplayer community, I would like to extend my thanks and kudos to Bioware. Well done, guys. Well done.